By Scott Gilfoid: Tyson Fury is calling out unbeaten heavyweight challenger Jarrell ‘Big Baby’ Miller (30-0-1, 22 KOs) for a $100,000 spar or a bare knuckle fight ahead of his June 1 title shot against IBF/IBO/WBA/WBO heavyweight champion Anthony Joshua (22-0, 21 KOs) at Madison Square Garden in New York. Fury wants Miller to come to Big Bear, California to spar with him or fight him with just bare knuckles. If Miller took Fury up on his offer, it could end badly for the 6’9′ Tyson. Fury might have his hands full sparring Joe Joyce if they bring him back to Big Bear from the previous camp. Fury left Big Bear early. Some boxing fans think Fury was getting worked over by the 6’6″ Joyce at the camp, so he bailed early to go back to sea level to train at Freddie Roach’s Wildcard Gym in Los Angeles, California. Obviously that’s not going to happen, but it does show you that Fury, 30, is starting to realize that the attention that the Joshua-Miller fight is getting in the boxing world since the fight was first announced earlier this week. Miller is a talented American heavyweight with a near perfect record looking to pull off a ‘Rocky’ like upset against Joshua. More and more boxing fans are starting to realize that the heavy-handed Miller has a real shot at beating Joshua with his superior stamina, and high work rate. Is Fury believable here? There’s no one backing up Fury about his sparring story. It sounds like Fury is exaggerating to the extreme in talking about dropping Miller 7 times. It sounds like Fury is just talking at the top of his head for the heck of it. 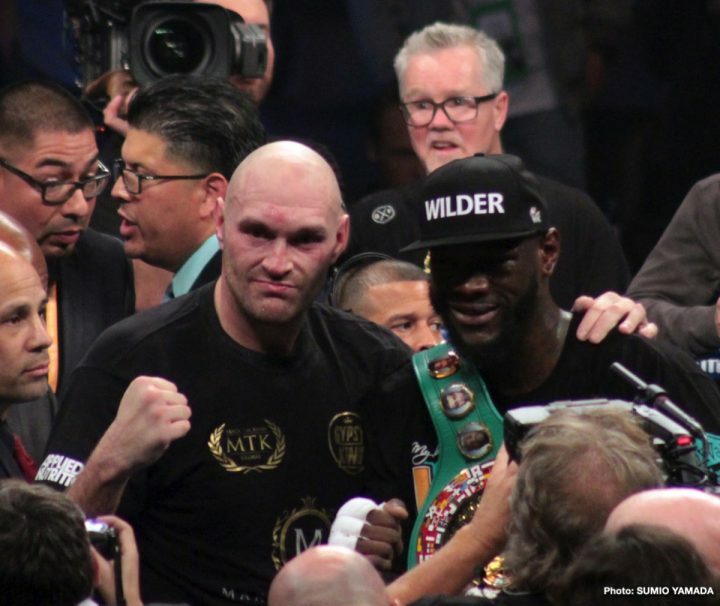 Fury’s next fight against WBC heavyweight champion Deontay Wilder (40-0-1, 39 KOs) is expected to be announced early next week for May 18 in New York. This is a rematch of their previous encounter on December 1 last year at the Staples Center in Los Angeles, California. That fight was scored a 12 round draw, but a lot of boxing fan thought Wilder deserved the knockout victory after he had Fury seemingly unconscious after knocking him down in round 12. It’s believed that Wilder learned how to get to Fury in the 12th, and that’s he’s going to start in where he left off in the rematch in May. Fury could be up against if it Wilder has figured out how to hit him with overhand rights while he’s in his crouching position like he was for virtually the entire fight last December. It’s in Fury’s best interest for Joshua to beat Miller, so that he potentially face him if he gets past passed Deontay next May. Things could go very wrong for both Fury and Joshua with both losing. But even if one of them loses, it’s bad news for the possibility of them fighting each other. If Joshua losses to Miller on June 1, then he’ll need to face him in a rematch four to six months later. That mean the remainder of 2019 will be shot as far as a Joshua-Fury fight goes. Likewise, if Fury loses to Wilder, he would need to try and get a third fight with him straightaway. The World Boxing Council could throw a wrench in those plans by ordering Wilder to face the winner of the Dominic Breazeale vs. Dillian Whyte fight. If Wilder has no other choice but to fight the Breazeale-Whyte winner, then Fury will be out of luck in getting a third fight with Deontay to try and avenge his loss. Wilder would likely accommodate Fury by giving him his third fight if it were up to him, but it might not be. It depends on what the WBC wants to do, and whether Matchroom Boxing promoter Eddie Hearn is going to be putting a lot of pressure on the sanctioning body to get them to order the Wilder vs. Fury fight. If Breazeale beats Whyte, it’s hard to imagine the WBC getting strict in ordering Wilder to defend against him right away. It’s very unlikely that we’ll see a Joshua vs. Fury fight in 2019, reason being that Deontay is going to be a pure menace for Tyson in the rematch. Wilder is going to make sure that if the Joshua-Fury fight happens, it’ll be with Fury coming off of a loss to him. Knowing Hearn, he might still make the Joshua vs. Fury fight even with one or both coming off of losses. Hearn wants that fight so bad he can taste it, and he can’t afford to wait too long for him to get it made. Joshua is a vulnerable heavyweight, and Fury has met his match in Deontay. Hearn was never in favor of Fury taking on Wilder in the first place. Now that Fury has already fought Wilder and failed to get the win, Hearn has been trying to convince the public that Tyson won that fight. In other words, Hearn’s clear rationale for repeating over and over that Fury beat Wilder, so that he wouldn’t fight him again and lose to him, like he should have last time if the referee had stopped the fight in the 12th after he hit the deck. Hearn wanted Fury to negotiate a fight with Joshua instead of facing Wilder again. But the problem was, Hearn wasn’t willing to give Fury the 50-50 deal that he wanted. Hearn can still make the Joshua vs. Fury fight with one or both coming off losses. The fight will be slightly tainted like the Amir Khan vs. Kell Brook fight will be after Amir likely loses his April 20th fight against WBO welterweight champion Terence Crawford on ESPN PPV at Madison Square Garden in New York.